Blackmoor is the name of a fictional world created by David Arneson. 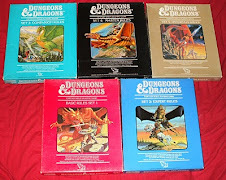 It is also the prototype of a game called Dungeons and Dragons, the first published role playing game. Unlike other fantasy worlds, such as J.R.R. Tolkien's Middle Earth, Blackmoor is a living world that is being explored to this day. Secrets of Blackmoor tells the story of the evolution of the role playing game, In 1964, David Wesely becomes a founding member of a club that includes history buffs, model makers, and miniature collectors. Hiding within the group, however, are a bunch of college students who are interested in war gaming. Within a year, the gamers meet a high school kid named Dave Arneson who is playing war games with his friends in his parents' basement. The influence of Strategos changes how they play their war games. But are they really following these old rules, or have they stumbled onto something truly unique by misinterpreting what it says? Should a game be constrained by rules, like Monopoly, or should there be no boundaries at all, like a game of make believe? One thing is very clear--something magical was going on in the Twin Cities. Secrets of Blackmoor investigates the origins of the role playing game, through candid interviews, archival footage, and newly discovered artifacts. A few comments of my own: Although I am very excited to learn about this documentary and really look foward to seeing the final product, I think the phrase "prototype of a game called Dungeons & Dragons" is an unfortunate choice of words. The phrase lends itself to multiple interpretations and would probably suggest to many that the documentary aims to dig into old wounds from the Dave vs. Gary debate. I am not sure that this is what we need right now. What actually intrigues me a lot more than that is that Secrets of Blackmoor offers to tell the story of the Twin City Gamers. Just seeing the faces of the players in Dave Arneson's group live on camera was such an awesome thing to behold. I think that those of us who have been reading about Dave's campaign for decades really will get a kick out of hearing them tell new stories in their own voices. I learned yesterday that according to the producers the film is already fully financed and that they expect to release it sometime during 2017. My hope is that the movie avoids playing up unnecessary controversy, but instead tells us the amazing story of the Twin City Gamers, an amazing group of creative gamers during a very important time in the development of our hobby. The text description is right. Something magical was going on the Twin Cities. That's something I am excited to learn more about. I agree that "prototype" probably isn't the best term. I'd have gone with "original version" myself. It's a sad state that telling the truth about D&D's history is considered digging up old wounds.